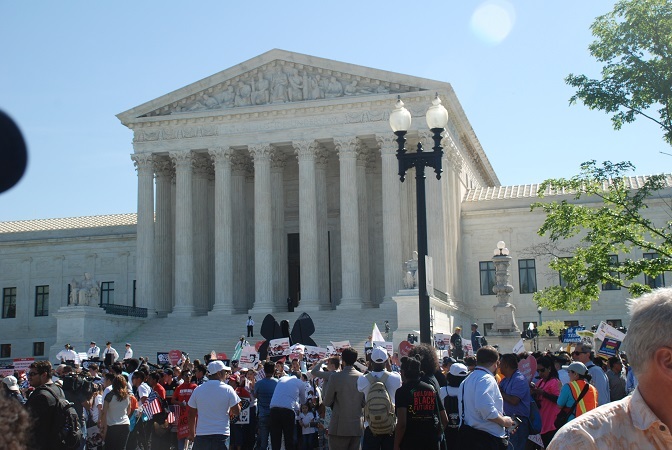 On March 19, the Supreme Court ruled that deportable aliens do not have a right to a bond hearing, even if they were not immediately detained following their release from criminal custody. The 5-4 ruling in Nielsen vs. Preap, affirmed that a non-citizen is subject to mandatory detention under section 236(c) of the Immigration and Nationality Act (INA) for past criminal offenses that make them deportable. The ruling overturns a decision handed down by the notoriously activist Ninth Circuit Court of Appeals. The plaintiff, Mony Preap, and a similar class of immigrants argued that mandatory detention should not apply to them and they should be released because Immigration and Customs Enforcement (ICE) did not detain them “immediately” after they were released from criminal custody. The immigrants further argued they deserved due process and a bond hearing so they could demonstrate they were not a public safety threat and would not flee. The plaintiffs’ argument boiled down to grammatical nitpicking – can the government detain criminal aliens if ICE did not “immediately” take custody after their release. “Especially hard to swallow is respondents’ insistence that for an alien to be subject to mandatory detention under §1226(c), the alien must be arrested on the day he walks out of jail (though respondents allow that it need not be at the jailhouse door—the “parking lot” or “bus stop” would do),” Justice Samuel Alito noted in his majority opinion. Alito is referring to a provision of the INA, 8 U.S.C. § 1226(c), which mandates that an appropriate government agency “shall take into custody” certain immigrants during the period of their deportation or removal proceedings. Such an immigrant is Mony Preap, the lead plaintiff in the case. He is a legal permanent resident but had two drug convictions which qualified him for deportation. Although he was released from criminal custody in 2006, he was not detained by immigration authorities until 2013, when he was released from jail after an arrest for another offense. In his concurring opinion, Justice Brett Kavanaugh said it “would be odd” that Congress would pass an Act that “mandated detention of particular noncitizens because the noncitizens posed such a serious risk of danger or flight that they must be detained during their removal proceedings,” but allowed for them to roam free during their removal proceedings. Alito pointed out that in less than three years (January 2014 to September 2016) there were a total of 21,205 declined requests from ICE in 567 counties in 48 states including the District of Columbia. The Supreme Court’s decision is an important victory for the rule of law and the American people. IS the Supreme Court standing for USA tax payers s? I think I might have a heart attack>>>. The astonishing thing, ok not astonishing but expected, is that four justices bought the argument that illegals cannot be held if they were not taken into custody immediately. Under what concept of the law is that acceptable? And how would they be entitled, or even be able, to prove they would not “flee”. They would be far more likely to not show up for court hearings, as many do not do now. The incentive is not to do so because little happens when they don’t. And as noted by Judge Alito sanctuary jurisdictions refuse to cooperate with the government and give notice when they release criminal aliens. So illegals gain assistance in avoiding ICE by those jurisdictions. Those four justices are part of the attempt to establish open borders without an official declaration. Because when everything you do undermines efforts to actually enforce the law and remove illegals from the country, and that is most of the left now, you are for open borders. Some try to blame Trump for “doing nothing” about the masses of illegals overwhelming our southern border, but most of what he has tried is subsequently stopped by some lower court judge. Ah…Yuh! Aliens are by definition a flight risk. They can’t be granted bail. That’s why there are so many “absconders” at large. This is good news. No wonder we once again hear the liberals talk about packing the Court. To stay in power, the liberals need a continuing stream of low-skilled, uneducated people who will end up voting for them. It’s this quest for votes that drives the sanctuary city movement. Yea! The first of many good decisions to come from the revitalized Supreme Court.